I apologize to all of you for not posting in a long time, but I have decided to OUT myself and my skin and disregard my vanity from now on. My food allergies are extremely apparent since any internal and environmental allergic reaction is showcased on my skin as eczema, atopic dermatitis, contact dermatitis and/or hives. For summer months, I have been taking Allegra during the day and 10 mg Hydroxyzine (Atarax) at night, drinking a TON of water and taking 2-4TBS Barleans Flaxseed Oil daily. Since I do get alot of hand eczema, I started carrying nitrile gloves wherever I go since my hands are covered with open cuts and rashes. This particular picture was taken after a very bad reaction after eating an everything bagel with vegetable cream cheese. I realized I can't have them anymore because it causes too much suffering...most likely because there is guar gum (derived from soy) in all cream cheese and maybe even soybean oil in the bagel. When my hands are this bad, I try not to use any soap since practically all soaps contain so many chemicals which go directly into my bloodstream. I like to rub on Nutiva Organic Extra-Virgin Coconut Oil from Vitamin Shoppe since coconut oil has antibacterial/antifungal properties and is very good for the skin, if you are not allergic to it. I usually rub some on then wash my hands thoroughly, then dry with a clean towel then rub on more coconut oil then put on nitrile gloves to allow my skin to heal. It usually takes two-three days after a reaction for my skin to heal up. If its really bad reaction (from soy protein or days after an anaphylaxis event) with open, weeping wounds all over my body, Prednisone does the trick but I try to stay away from Prednisone because of its many serious side effects. I do have corticosteroids like Betamethason Dipropionate aka Diprolene (liquid "lotion" form) for hands and body and Elocon cream for the face which works like a charm but I question how healthy all these steroid creams are for my body if I use them three times a day every day...so I try to limit my use to times of desparation. If you have hand eczema, I encourage you to share your stories of what seems to help you most. Hopefully, through reading this and seeing future pictures, you will know you are not alone! Oh I feel sorry for you. I have similar problems with my hands. Not from a food allergy. But I think from soaps and NITRILE gloves. I'm searching online for similar stories and came upon your blog. Sigh...but not the same thing. Good luck. Feel your pain a bit. Awww that's sweet, thank you for stopping by. Yes not the same, but I am highly allergic to dimethicone and lanolin as well as many PEGs, Vitamin E and glycerin because they usually are from soy and I get contact dermatitis from those which is prob the same thing you are getting. I will be doing a blog post on soaps, lotions and cosmetics very soon so stay tuned! Maybe something I share can help you out. Its definitely not easy and I hope you find relief and answers! 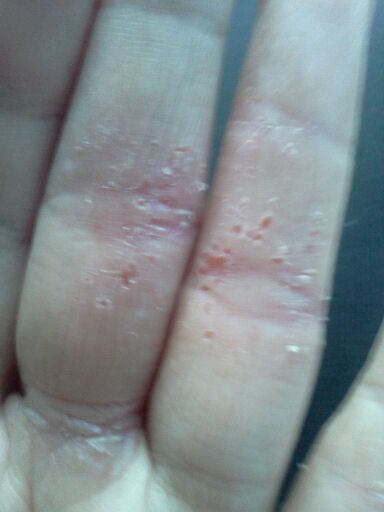 I get terrible, terrible flare ups of eczema on my hands. It comes and goes. Not a trace of it for three or four months -- then, it'll begin. A month later pretty much ever square inch of my hands will be dry, cracked, bleeding an peeling -- deep fissures all over the place. The condition will be like this for a month to two months, then it will clear up on, seemingly on its own, and my hands will go back to being normal for a few months. Then, the whole cycle will repeat itself. In my case, the condition was caused by medication I had been prescribed and was taking for another, unrelated condition. One of the known side effects of being on that medication was eczema. They didn't tell me, though, that the eczema problems would continue even after I was through taking the medication. I thought it was only a side effect I would have to deal with while I was actually on the medication. I'd never, ever, not once, ever experienced eczema anywhere on my body until, the very first time, about three weeks in to taking the medication I was prescribed. That was about 15 years ago, and the regular bi-annual-ish flare-ups have been going on ever since. Even though I was only on that medication for around 10 months. Anyway, I've tried absolutely everything when the flare-ups occur, and nothing ever seemed to help at all. I even took more prescription medication in the form of a topical cream that the condition didn't respond to at all. I kept going back to the Doctor who kept upping the intensity of the cream. The condition never responded, no matter how intense. Finally, the Doctor refused to up the intensity any further, as the concentration of the active, medicinal ingredient in the cream would be too dangerous in any higher amount. Fortunately, just by chance, really, a friend of mine remarked on the appearance of the condition when I had run into her during a period of a particularly bad flare-up. She doesn't suffer from eczema, per se. But, does have problems with dry skin which causes her some level of discomfort. She recommended that I try a remedy that she uses and has found to be effective in providing relief with her condition. So, I gave it a shot. And, it's the only thing I've thus far found that actually helps. It's a cream... more of a sort of wax, really... called 'Beeswax cream'. The stuff I use is made by a Company called "BeeSweet", but I think other manufacturers make it as well. It contains only grape-seed oil & beeswax. When one of my flare-ups begins now, I begin applying generously, rubbing it into all of the dry patches on my hands, three or four times per day -- when I wake up in the morning, when I go to bed at night, and one to three times through the rest of the day. If I make sure to do this every day, the flare-up completely goes away again in just about five to seven days, instead of a month to two months. And, at no time during those five to seven days does it ever get anywhere near as bad as it does if I don't use the cream. My will still get coarse, tough and dry a bit, but I don't get the cracks, bleeding and deep fissures I get if I don't use the cream. And, the itching and burning is kept under control to a very great degree as well. I would highly recommend trying the beeswax cream if you're suffering from eczema. It's been a lifesaver for me. Was that medication a benzodiazepines or thyroid medications? Just wondering. I am suffering myself. The medication that caused the eczema was Isotretinoin - better known by the brand name "Accutane". It was prescribed for an acne condition. Thank you for sharing this story and the updated information. I was away from the blog for awhile so I just saw this now. I am happy to hear you figured out the culprit and a remedy that works for you! Flare-ups are sometimes hard to pinpoint and I highly recommend seeing an allergist to test for environmental allergens as sometimes the environmentals will trigger a reaction and we think its food or products and vice versa. I'm so grateful so many companies are getting simpler and purer with their products. Have an amazing week and thank you for stopping by!